Brendan picked a great weekend to visit. He flew out of Ohio just in time on Friday. Dayton now has around a foot of snow on the ground and Columbus has twenty inches. Brendan is really enjoying the warmer weather here. Friday night we had dinner at Rudy's. We began our Saturday with breakfast tacos and headed downtown. Now that the construction on I-10 between Loop 410 and Downtown is finished, it is an easier drive down there. We have five lanes each way! There was a lot of activity downtown with a cheerleading competition going on and and high school Spanish Club conference going on too. We had lunch at Schilo's Deli and enjoyed some good German food. 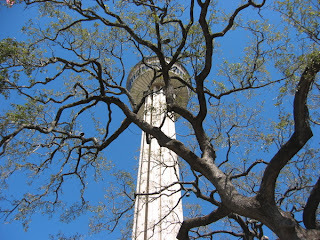 We headed over to Hemisfair Park in hopes of going to the observation deck in the Tower of the Americas. They raised the ticket price and bundled it with a ride and movie now offered in the Tower. 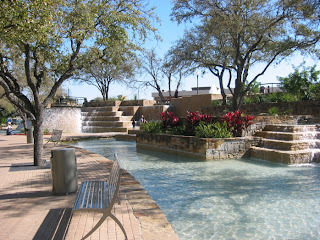 We passed due to the high ticket prices but walked around and saw the cool fountains. 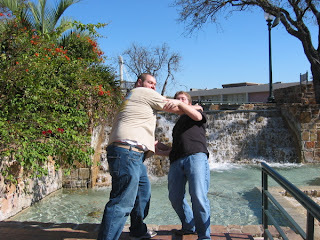 Don't worry, no Graftons were actually thrown into the fountain! 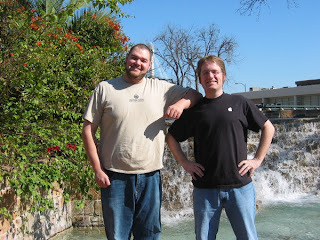 We took a riverboat tour at the Riverwalk, which is a good time. We purchased the tickets for "two locals and a tourist/Yankee." 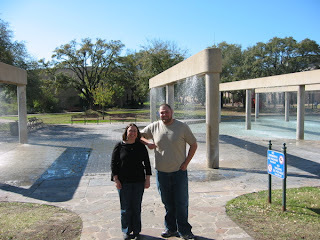 We enjoyed a margarita at Casa Rio, the first restaurant on the Riveralk. We headed north for dinner at a Mexican restaurant, Perico's. After all the walking, food, and fun, we were not able to stay up too late last night.